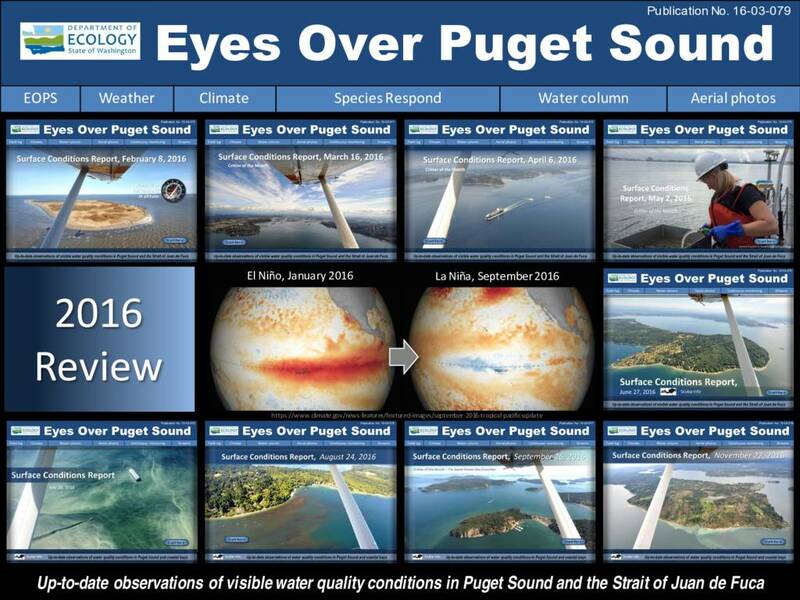 Description The year 2016 in pictures: After two years of very warm air and record high water temperatures starting with the Blob (2015) and followed by El Nino (2016), temperatures have fallen and remain slightly warmer than normal in Puget Sound. Very low summer river flows (e.g., Fraser River) reflect climatic predictions for the NW. Record temperatures and low salinities occurred alongside observations of abundant jellyfish, floating macro-algae, and Noctiluca blooms. Surprisingly, only South Sound developed very low summer oxygen levels in 2016. In the fall, La Niña came with a punch, rain increased, and air temperatures dropped. Will this be an unusual La Niña?